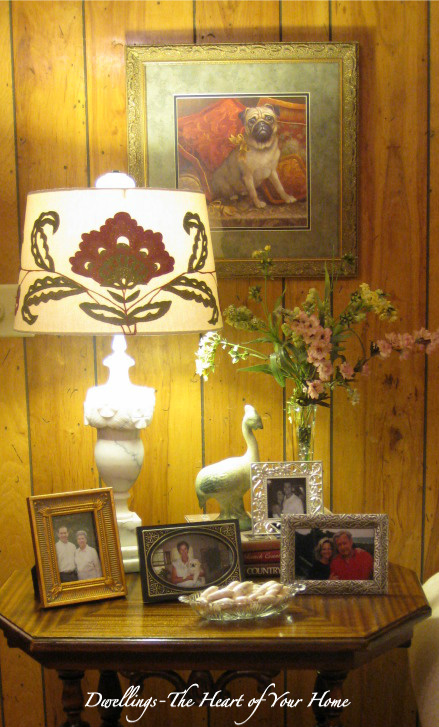 The den table lamp needed to be replaced. Years ago the part of the shade that keeps it attached to the harp had broken so the shade was just resting in place and if the table was bumped, the shade fell. After a few falls, I got smart and used a small piece of duct tape to add a little "stick." Sometimes it worked and sometimes it didn't. I was thrilled to find this one! The shade! It was discolored and dented...U-G-L-Y! So my next hunt was for a shade and it didn't seem to be going very well, until today! 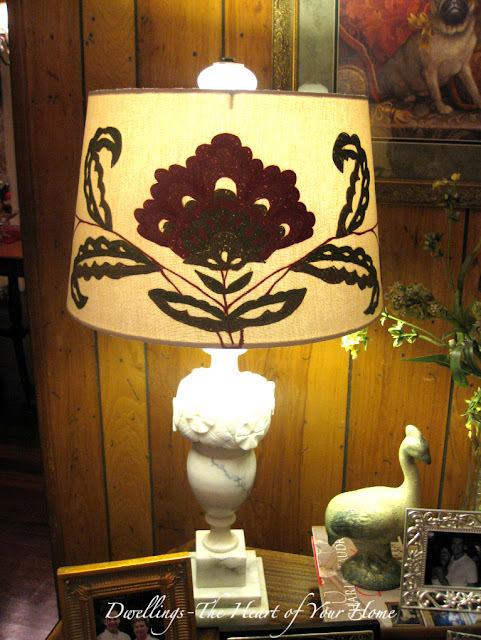 My favorite color is red so I was very happy to find this crewel applique lamp shade. So much better and the pattern really works well with the drapery and pillow fabric in the den. The pattern continues all the way around the sides of the shade which makes it nice from all angles. I found this at TJ Maxx and thought it a bit pricey at $35 (ouch!) but I just couldn't pass it up! I thought $75 for an antique lamp and crewel lamp shade was pretty good! what are you hunting for and have you found it yet?! Sometimes you just have to do it--that shade is perfect! Love your lamp and table vignette; gorgeous setting. 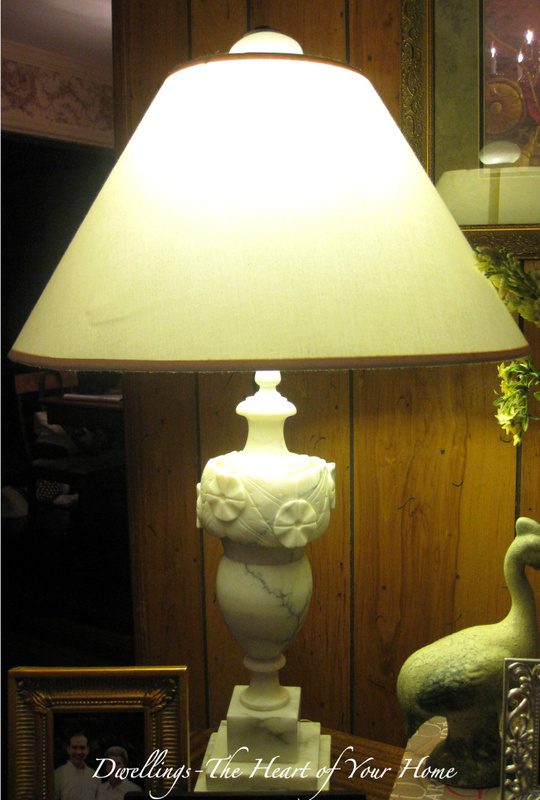 I LOVE your alabaster lamp! I have been looking for one or a pair--have bid on many on e-bay, but they always go so high, especially with shipping. It looks like you found a beauty and for a great price! The shade is very unique! The shade is perfect with your new lamp. Love the alabaster. I've been looking for one for a while, but no luck so far. I saw that shade at TJ and thought the same thing. 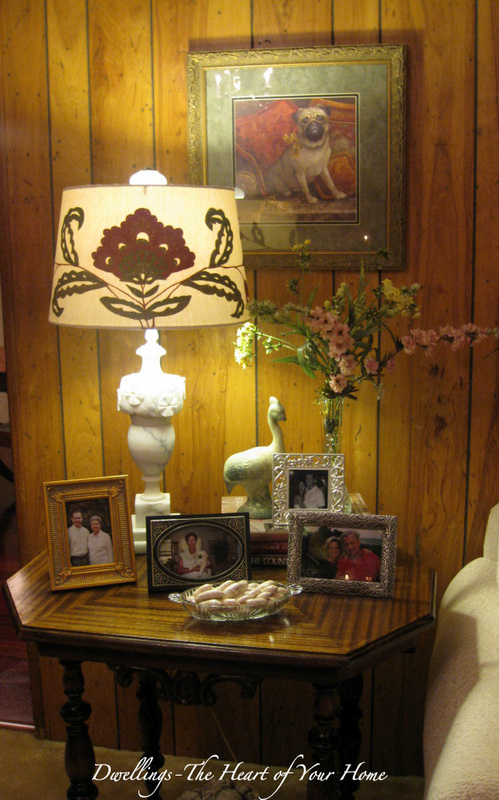 But, it adds that wow factor that the lamp needed. I have an alabaster lamp stowed away. Think I'll dig it out. It was so worth it Cindy...looks gorgeous! Oh that lamp is beautiful! And the shade looks perfect. Well done! Cindy, I left you a note earlier, but blogger ate it! I love the lamp and the shade. Great finds! I love how good they look in your room. 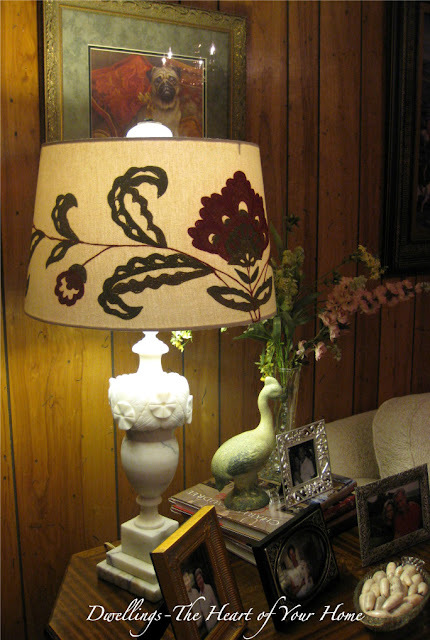 And the shade compliments not only your fabric, but your lamp so well! What have I been looking for? Well, for several years, I have been trying to find extra pieces to a pattern of china I collect. And I found them! I was doing a major happy dance, and they were just up the road in Georgia. Nicest person ever had them for sale at an EXCELLENT price. Can you see my smiling??? Very beautiful lamp. I don't know that I've ever seen an alabaster lamp base. I'm loving the crewel lampshade. I think it goes very well with your living room decor. Way to go!! I'm looking for a small drum-shaped lampshade to go over the floor lamp I moved to the living room. Haven't found it yet...may have to check out the antique mall this week. I L.O.V.E. your lamp!!! I passed on a set years ago that were a very reasonable price. I regret that mistake. Haven't found another reasonably priced alabaster since! 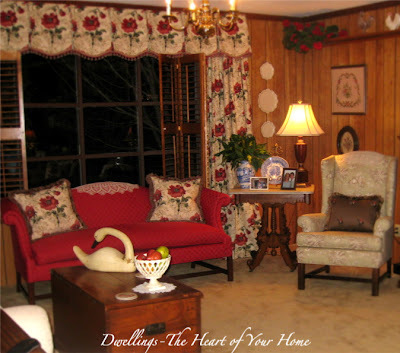 Your's has a beautiful design! That lamp is divine and I never use that word. I passed up an alabaster once and am still kicking myself. Beautiful lamp, Cindy! I've got an alabaster one in my living room, too. Love the warmth of the color and coolness of stone. I'm with you.....sometimes you've just gotta bite the bullet and spend a few extra bucks to get what your heart wants. :) Nothin' wrong with a little spoiling ourselves, is there? lol! That is such a great lamp and shade. I love lamps. Thanks for joining wow. 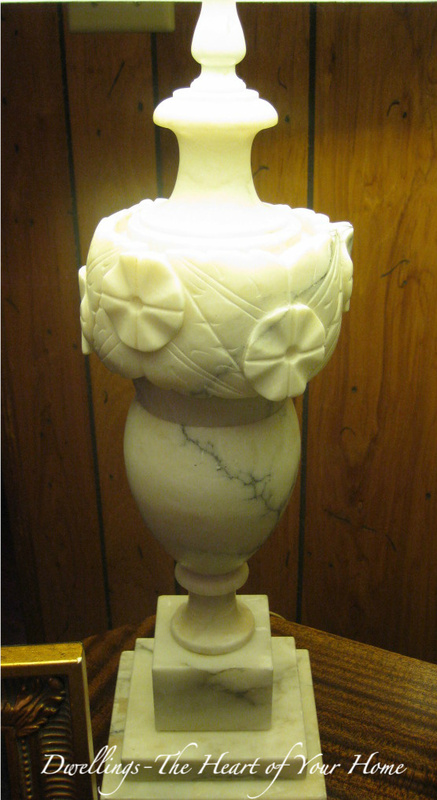 Believe it or not, I'm looking for a lampshade for the alabaster lamp in my office! What a great shade you found, and it looks so good on your lamp. That shade looke like it was custom made for your room! 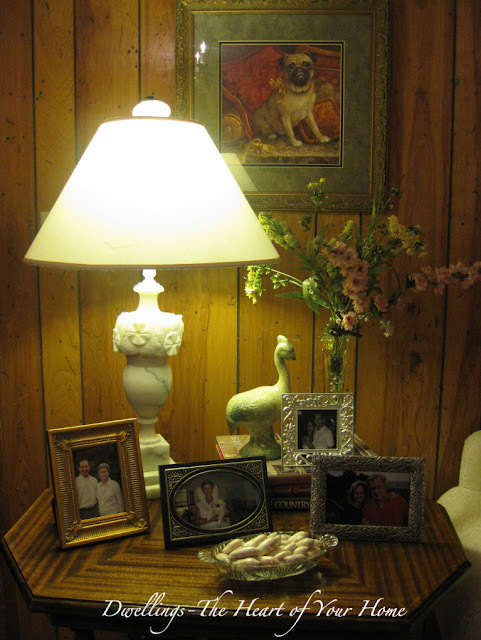 I have four or five alabaster lamps in my house and I LOVE them too. I love anything that is urn shaped! This is an extra pretty one, Cindy! The alabaster lamp is gorgeous as is the crewel shade! Gorgeous put together! Beautiful lamp and I love the shade. This is perfect for your room!